Another Voigtlander I can’t leave out is the Perkeo series… Perkeo I, II, and IIIe. 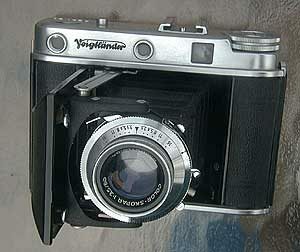 These are 6×6 cameras of the usual excellent build, and I think Voigtlander’s BEST folders from a reliability and pocketability standpoint. Few 6×6 cameras are as svelte and as well built machines giving you that terrific big 6×6 negative and still fit in your pocket! All three models can be found with either the f4.5/80mm Vaskar or the f3.5/80mm Color-Skopar lens. However, it is far more likely to find the Perkeo II & IIIe with the Color-Skopar. Shutters for these models ran the gamut from Pronto to Synchro-Compur, with the Prontor S slightly more common on this model. So what’s the difference between a I, II, or IIIe ? The Perkeo I indicates that you have released the shutter and taken a picture and prevents double exposure till film is wound. The Perkeo II tells you which frame you are on… a real frame-counter, Auto film stop / double exposure prevention. 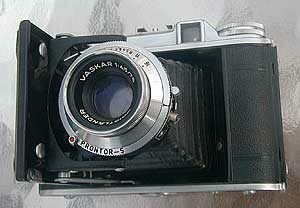 The Perkeo IIIe is the only Perkeo with a rangefinder, though UNCOUPLED, but sacrifices the space under the top cover once held by the Auto frame counter. This is a VERY RARE camera as it was only built for less than a year in 1953. 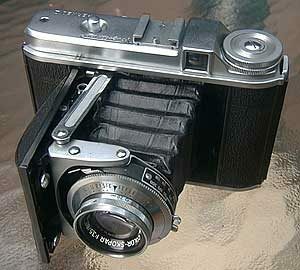 Really nice camera…like the Agfa Isolette III.